I’ve written many times about my “fraidy-dog” Yoda, who is afraid of almost everything. In fact, for fun, I’ve compiled a list of his fears here. I’ll have to update that page with two new additions, one from last night. His sister Leia loves to steal socks, but Yoda never does. Leia has so much fun running around the house with a sock in her mouth that I felt sorry for Yoda—he was missing out on the fun. Last night I tried to give him my other sock, but he just hurried away, hiding behind my chair. Since he was a small pup, he hasn’t really played with stuffed toys or anything soft—only rawhide bones or hard toys. If I try to play with him with a soft stuffed animal, he simply runs away. Sad! It got me thinking that maybe he is missing out on some of the fun he could be having if he were less afraid. I thought about my own childhood. I definitely didn’t live life to the fullest; I was always cautious. My dad always repeated a saying to me: A coward dies many times, but a brave man dies only once. I understood what he said even as a kid, and I tried not to let fear of anything keep me down. These musings inspired me to write a book in verse, an illustrated book that both children and adults would enjoy. 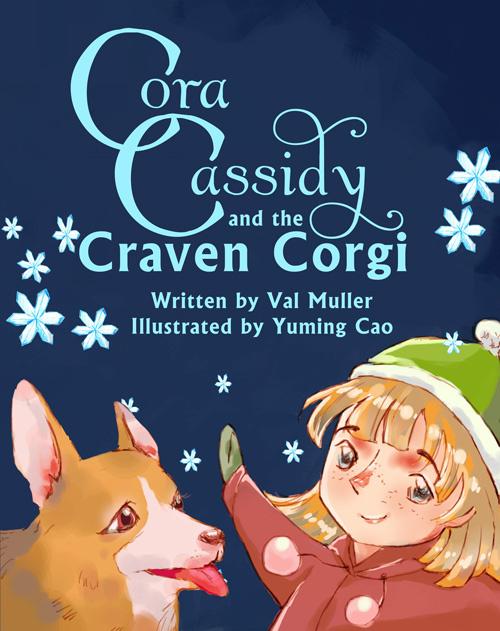 It’s called Cora Cassidy and the Craven Corgi, and it will be available soon. I found an amazing illustrator at my alma mater, The College of William and Mary. Yuming Cao definitely captured the emotion behind each scene in the book. The story takes us through a year in the life of Raven, a cowardly little corgi. Raven explains to her person Cora exactly what terrifies her about each part of the year, and Cora tries to dispel the corgi’s fears, looking with optimism at each time of year. Cora’s glass is always half full. For Raven, the glass is usually half empty (and full of something terrifying!). My favorite line from the book is Cora’s: “Every month of the year keeps improving.” I love the optimism she shows when thinking about the world. Anyone who knows me knows how much I fear winter—I was trapped in a car during a snowstorm for thirteen hours once, and I’d much rather deal with a little heat and humidity than with crippling snow. I aspire, though, to look at the world the way Cora does. Cora views each day as a gift, and she finds the enjoyable and the memorable in each time of year. Cora truly embodies my father’s advice, appreciating each day and all it has to offer. Posted on September 14, 2014, in inspiration. Bookmark the permalink. Leave a comment.